The finalists TosJis, SmartBin, and Rushero, have been incubated by Impact Hub for the last 6 months, and the final pitching night will be the culmination of all their hard efforts. If you want to find out more about the teams, Geeks has covered TosJis and SmartBin, where we found out more about these two young teams, and we can’t wait to see the innovative ideas that all three teams have to present. 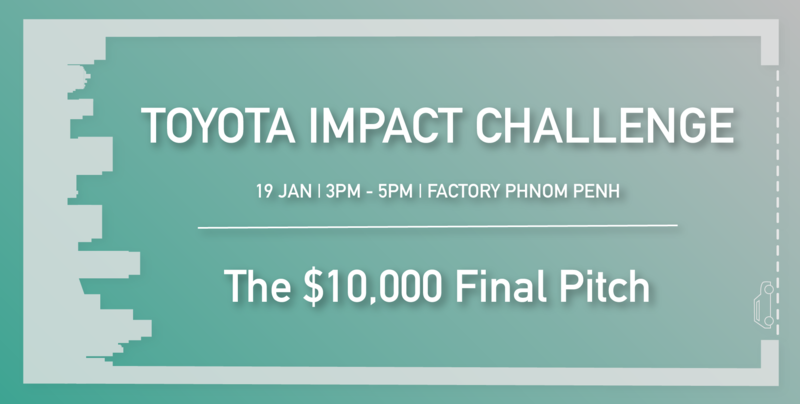 The Toyota Impact Challenge is a 9-month long programme run in partnership with Toyota Cambodia that aims to find and incubate the best ideas in road safety, smarter cities, future transport, and environmental protection. The pitch will be held at WS1 by Factory Phnom Penh on Saturday 19th January, 3-5pm. To find out more information check out Impact Hub Phnom Penh’s Facebook page HERE. Geeks will definitely be there and we look forwarding to seeing as many of you there as possible!